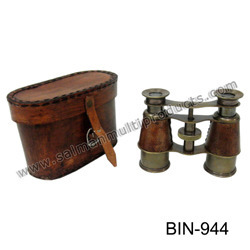 Owing to our hardworking staff, we have set benchmark in the domain of manufacturing and exporting of Binocular with Leather Box. As its name conveys, these are fabricated from leather and are designed for longer usages. These leather boxes could be availed in numerous ranges and specifications and are fully customizable. These would keep your binoculars in safe position and you would definitely like its quality and enchanting appearance. Moreover, these are offered at reasonable prices to our trusted consumers. Established in the year 1995, we, “ Salman Multi Products”, are engaged in manufacturer, supplier & exporter an impeccable range of Brass Cremation Urn, Aluminum Urn, Flower Vase, Nautical, Lighting, Pendant Lamp, Table lamp, Decorative World Globe, Astronomical Instruments, Nautical Miner Lamps and Brass Ship Bells. Manufactured using superior quality components, these products are designed in accordance to international quality standards. Further, we stringently test these products on various parameters to ensure flawlessness. Owing to their excellent performance, superior quality and long service life, these products are highly demanded by the customers. We are empowered by a dexterous team of professionals having vast experience in the respective domain. Our infrastructure unit provides quality control unit, research and development department and manufacturing unit. All the above units help us in meeting the requirements of our clients timely. In addition to this, we have well trained experts for the maintenance of the products. Due to our vast range of products, we have achieved a huge clientele from UK and US.We generally deals in foreign queries.